Hypertension and heart failure are common cardiac emergencies. In addition to standard treatments including intravenous diuretics, nitrite, antihypertensive agents, and oxygenation, a thorough work-up to discover the causes of secondary hypertension, including renal disease, renovascular disease, adrenal gland dysfunction, neurogenic disease, endocrine disorder, and medication-related, is mandatory. In this study, we present a rare case of hypertensive crisis and acute decompensated heart failure with reduced left ventricular systolic fraction, which was secondary to synchronous clear cell renal cell carcinoma (RCC) and pheochromocytoma. A 49-year-old woman presented to the emergency department with worsening dyspnea and generalized edema for 10 days. Her past, personal, and family histories were unremarkable. On physical examination, her temperature was 36.6°C, blood pressure was 194/112 mmHg, pulse was 120 beats/min, and respiratory rate was 24 breaths/min. Oxygen saturation was 100% under ambient air. Expiratory wheezes bilaterally and crackles at the left base were noted. A grade 2/6 systolic murmur was heard at the left upper sternal border and apex, radiating to the axilla. Generalized anasarca with pitting edema over the bilateral upper and lower extremities was noted. An electrocardiogram showed sinus tachycardia and left ventricular hypertrophy with a strain pattern. 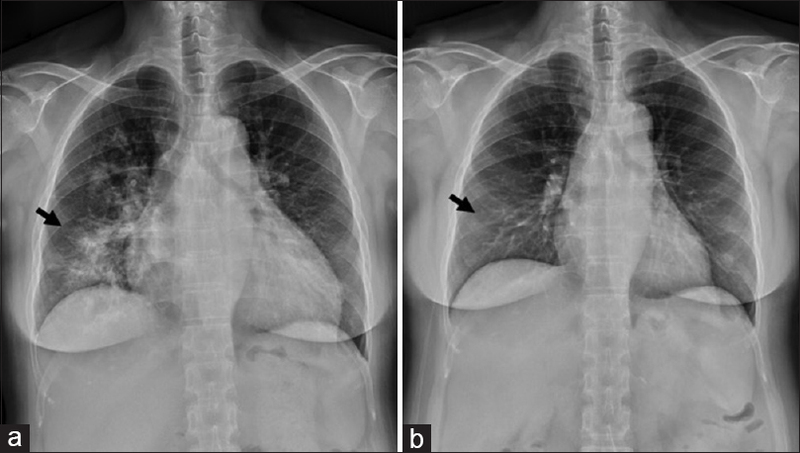 A chest X-ray revealed cardiomegaly and patchy airspace consolidations with infiltrations in the right lung field [Figure 1]a. A transthoracic echocardiogram showed a global left ventricular hypertrophy and hypokinesia with an ejection fraction of 22%. Pertinent laboratory results revealed normocytic anemia and elevated serum B-type natriuretic peptides levels of 2,440 pg/mL, with normal liver function, kidney function, and electrolyte status. Medications with intravenous nitrite, furosemide 20 mg twice daily, and oral anti-hypertensive heart failure medications including bisoprolol 0.625 mg once daily, perindopril 5 mg once daily, sustained-released nifedipine 30 mg twice daily, and spironolactone 25 mg twice daily were prescribed. An abdominal sonography was performed to evaluate the underlying causes of secondary hypertension, which demonstrated a huge lobulated heterogeneous mass (approximately 7.7 × 6.4 × 9.3 cm3) at the lower pole of the right kidney and a mass (approximately 4.2 × 3.2 cm) over the left suprarenal area. The masses were confirmed through magnetic resonance imaging [Figure 2]. Moreover, a urine catecholamine analysis revealed elevated levels of dopamine (991.7 μg/day, normal range 138–540 μg/day) and norepinephrine (104.1 μg/day, normal range 10–80 μg/day) with a normal epinephrine (7.6 μg/day, normal range 0–24 μg/day) level. The medication of bisoprolol was shifted to labetalol 200 mg twice daily. The patient underwent computed tomography-guided biopsy of the pulmonary nodule, left laparoscopic adrenalectomy, and right laparoscopic radical nephrectomy. Grossly, a renal tumor extended into major vein and invaded perirenal fat and peri-pelvic fat tissue. The adrenal gland was a brown tumor mass. 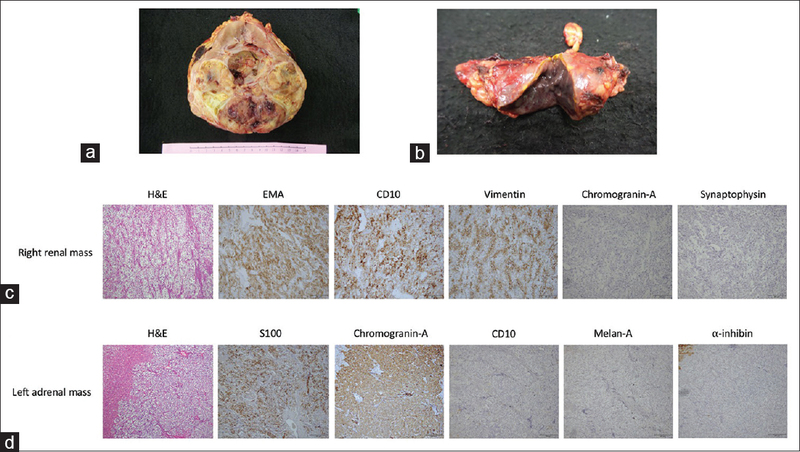 Histopathological analysis confirmed the diagnoses of clear cell RCC of the right kidney (Fuhrman nuclear grade II) with metastasis to the lung. To exclude the possibility of neuroendocrine differentiation, which impacts the overall prognosis of RCC, immunohistochemical staining for the neuroendocrine feature, including chromogranin-A and synaptophysin, was performed and revealed negative results. Moreover, based on the WHO Pathology and Genetics of Tumors of Endocrine Organs, few foci revealed spindle cell change, nuclear hyperchromasia, and necrosis of tumor cells, indicating biologically aggressive behavior (atypical) pheochromocytoma of the left adrenal gland [Figure 3]. Genetic analysis of the patient revealed no mutation in the coding region of von Hippel-Lindau (VHL) gene. Target therapy with sunitinib was initiated. The blood pressure was 146/86 mmHg 1 month after surgery. One year later, a chest X-ray revealed a normal heart size without visible airspace consolidations [Figure 1]b, and an echocardiography demonstrated normal left ventricular systolic function. Possibly due to the residual tumor, pre-existing hypertension, or sunitinib-related hypertension, the patient is presently under target therapy for her RCC and takes oral antihypertensive medications with stable disease. Synchronous RCC and pheochromocytoma occur very rarely. In a review of 80 coexisting renal and adrenal masses among 550 radical nephrectomies with ipsilateral adrenalectomy, only 2 of them are synchronous RCC and pheochromocytoma. In such rare circumstances, specific genetic mutations result in VHL disease or familial pheochromocytoma and RCC syndrome have been proposed. The negative results of VHL gene mutation and unremarkable family history in our patient make the diagnosis of these two diseases less likely. The prognosis of pheochromocytoma is excellent; however, it is poor in advanced clear cell RCC with median overall survival ranging from 20.1 to 29.3 months even under target therapy. The reasons for RCC-related hypertension include increased renin secretion, ureteral or parenchymal compression, presence of arteriovenous fistula, and polycythemia, which account for approximately 40% of patients with RCC. Mechanisms of RCC-related renin secretion consist of producing renin by the neoplastic cells from proximal tubular cells and compression of renal parenchyma by tumor mass leading to intrarenal ischemia and activation of renin–angiotensin system, which possibly contribute to the hypertensive crisis in our patient. Pheochromocytoma is a tumor derived from chromaffin cells in the adrenal medulla; it secretes catecholamines, including norepinephrine, epinephrine, dopamine, and other hormones. High concentrations of norepinephrine or epinephrine contribute to sustained hypertension, which develops in approximately half of these patients; however, patients with dopamine-secreting tumors are most often normotensive. Evidence suggests an association between heart failure and pheochromocytoma, although the mechanisms are unclear, probably due to excess catecholamines. Our patient presented with hypertensive heart failure along with synchronous RCC and pheochromocytoma. With the combination of huge RCC with renal compression and unique neuroendocrine feature of pheochromocytoma, the overactivation of both the renin–angiotensin and sympathetic systems may cause severe hypertension that can progress to stress cardiomyopathy and heart failure in our patient. In conclusion, the causes of secondary hypertension should be surveyed extensively in patients with a hypertensive crisis and acute decompensated heart failure. 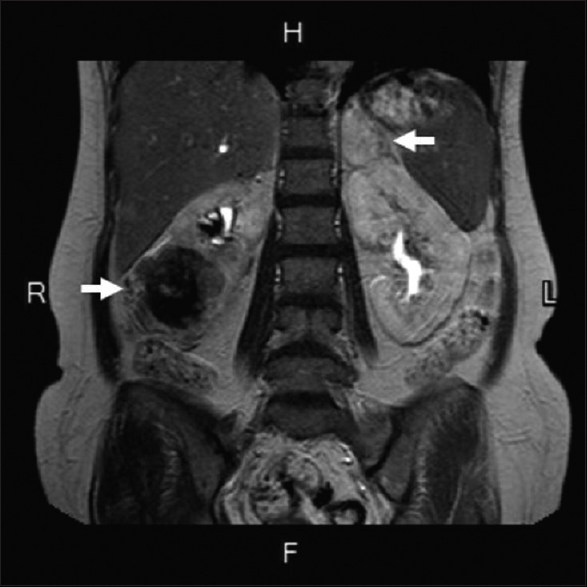 Although rare, synchronous RCC and pheochromocytoma should be evaluated in these patients to provide adequate treatment and avoid delayed diagnosis and catastrophic outcomes. We thank the technical assistance for analysis of VHL gene by Ms. Huang CC and Prof. Lin SH in National Defense Medical Center, Taiwan. Rasmuson T, Grankvist K, Roos G, Ljungberg B. Neuroendocrine differentiation in renal cell carcinoma – Evaluation of chromogranin A and neuron-specific enolase. Acta Oncol 1999;38:623-8. Thompson LD. Pheochromocytoma of the Adrenal gland Scaled Score (PASS) to separate benign from malignant neoplasms: A clinicopathologic and immunophenotypic study of 100 cases. Am J Surg Pathol 2002;26:551-66. Bahrami A, Truong LD, Shen SS, Krishnan B. Synchronous renal and adrenal masses: An analysis of 80 cases. Ann Diagn Pathol 2009;13:9-15. Hernandez KG, Ezzat S, Morel CF, Swallow C, Otremba M, Dickson BC, et al. Familial pheochromocytoma and renal cell carcinoma syndrome: TMEM127 as a novel candidate gene for the association. Virchows Arch 2015;466:727-32. Schmid TA, Gore ME. Sunitinib in the treatment of metastatic renal cell carcinoma. Ther Adv Urol 2016;8:348-71. Dahl T, Eide I, Fryjordet A. Hypernephroma and hypertension. Two case reports. Acta Med Scand 1981;209:121-4. Dopson SJ, Jayakumar S, Velez JC. Page kidney as a rare cause of hypertension: Case report and review of the literature. Am J Kidney Dis 2009;54:334-9. Zuber SM, Kantorovich V, Pacak K. Hypertension in pheochromocytoma: Characteristics and treatment. Endocrinol Metab Clin North Am 2011;40:295-311, vii. Mulla CM, Marik PE. Pheochromocytoma presenting as acute decompensated heart failure reversed with medical therapy. BMJ Case Rep 2012;2012:pii: bcr2012006319. Lee CM, Sim A, Kurugulasigamoney G, Ng LG. Heart failure as the first manifestation of renal cell carcinoma. Korean J Urol 2015;56:82-5.